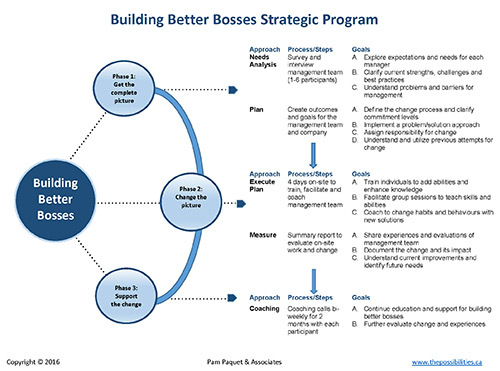 We offer a strategic program to improve management performance that will enhance workplaces. This is not a one-off training or the band-aide for a quick fix. It is an intensive and longer term program designed to include assessment, coaching, training and situational change that is long lasting. The goal is to build better bosses so workplace productivity, team effectiveness and leadership capabilities are enhanced. Our focus is to measurably improve how management thinks, behaves and responds at different levels. Our goal is to have all managers, regardless of specialty, department or team, perform and actively contribute toward business results with enthusiasm, confidence and power. We customize every strategic program to fit the specific needs of your management team and business. Companies and managers aren’t the same so change shouldn’t be delivered the same. This high level and challenging program is for the company that not only needs, but wants to improve their management performance and workplace productivity. This is appropriate if you have hired the right managers, supervisors and department heads but are frustrated because they are not good leaders, struggle with consistent supervisor and communicate poorly with staff. If there are some levels of success with your managers, then we kick it up a few notches so great leadership is consistent across the board. If it’s hard to find success, we create a baseline of management success so better bosses can be the norm and expectation. We focus our time, efforts and expertise to optimize managers, their leadership and their productivity. The goal in this program is to maximize your management team performance so they excel for great productivity. If you want to engage and motivate your managers for great communication, supervisory (people) skills and collaboration, then it is important to read more.